One of our original recipes brewed since 1997, a pale ale with copious amounts of American Cascade hops. Wonderfully aromatic floral nose balanced by a gentle bitterness with a hint of sweetness. No wonder this beer has won the most awards of all the beers in our range. Cask at the Prince of Wales, Farnborough. 29/07/16. Stronger aroma than I was expecting - healthy floral and hops. Deep gold. Thin white head. Light bodies. Sweet. A mixture of flora and some bitterness from the hops. A hint of honey. Very drinkable. September 19, 2015. Cask at Oliver Twist. Hazy pale amber with a small head. 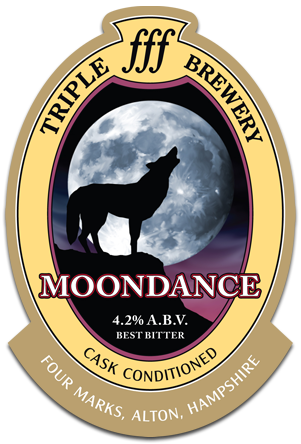 Aroma is malty with crisp and freshly crushed grain, bread, hints of toffee, some floral hoppy notes and hints of grass. Taste is light sweet and light to medium bitter. Finish is floral bitterness with some stalk notes, light malty sweetness with bread and grain. Medium bodied, soft carbonation. Supremely drinkable. Enough of a twang that it works after some more enthusiastically hopped beverages, but smooth enough for a pint. Rose & Crown, Sandhurst, Halloween beer festival, straight from the cask: Superbly easy drinking ale. Well balanced, subtle flavours. Nothing brash or uncouth about this ale. A marvellous beer to be drinking ‘neath the cover of October skies. Or any other month. Highly recommended. This yellow ale has a distinct citrus hoppiness, and a good bitter after taste. All in all, one of the best ales around. Amber hue, minimal head. Crystal clear. Heather flavours combine with bitters to give a refreshing mouthfeel. Cask at Victoria Station Spooneriam, 19/02/14. Clear golden with a moderate off white head. Nose is light floral hop, soft bread dough, peach, orange. Taste comprises orange sherbet, bread dough, light tropical fruit punch, trace of caramel. medium boided, soft carbonation, soft grassy bitterness in the close. Solid golden blonde. Cask by hand-pump at Pot Still, Glasgow - clear amber, thin creamy off-white head, floral, biscuit aroma, good film of lacing, biscuit, indeterminate hoppy bitterness, easy to drink and a lingering bitter finish with tangy bitterness. Good stuff. Cask @ Black Door, Helsinki. Pours a slightly unclear golden copper colour. Aroma of biscuit, gooseberries, nettles and grass. Flavour of strong grassy hops, grapefruit, biscuit, grains, nettles and weak fruitiness. Light bodied and a lingering bitter finish with tangy bitterness. Good stuff. Pours a slightly unclear golden copper colour. Aroma of biscuit, gooseberries, nettles and grass. Flavour of strong grassy hops, grapefruit, biscuit, grains, nettles and weak fruitiness. Light bodied and a lingering bitter finish with tangy bitterness. Good stuff. Pours hazy golden color with a small head. Aroma of citrus fruits, hops, toffee and grass. Flavour of grass, citrus fruits, mild goose berries and malts. Very bitter and grassy palate. Nice. A hazy amber ale with a citrus and pine bitter, hoppy flavour fruity and sweetness on the fruity finish.